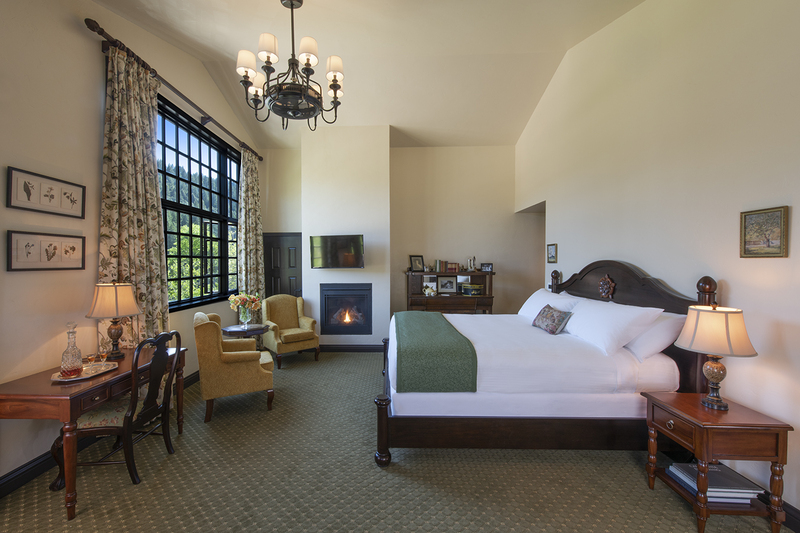 A beautiful suite with vaulted ceilings, gas fire place, desk with outlet, and an oversized window faces the Rose Garden and Reed mountain. A second window overlooks the golf course. This room is ADA-compliant. Guests can access this room by elevator. The bathroom includes a roll-in shower for wheelchair users. To view other ADA-compliant rooms and general accessibility information please see our Accessibility Features page. Clara was the fifth Benbow child. She was considered the heart of the family, especially after mother died. A devout practitioner of Christian Science, she encouraged her siblings to read lessons daily and think only the highest thoughts. She was a school teacher, diplomat, rancher, artist, and she worked the front desk and cooked once the hotel opened. During construction, she and Helen would color-code the rebar to be installed the next day by the unskilled workers. She also helped raise Burt’s three boys after Burt’s wife died.